Smaller baseballs with flatter seams are carrying farther, turning some warning-track outs into round-trippers. Did decreased air resistance send this ball over the wall? Whether it’s witnessing the towering moonshots of Aaron Judge or Scooter Gennett’s four-homer game, every baseball fan has had a moment of home run shock this season. In the span of a few short years, MLB has gone from the age of the pitcher to the era of the dinger, and the evidence for why the shift occurred keeps pointing back to the baseball. The baseball itself was initially identified as the most likely culprit for the spike in homers through a process of elimination. 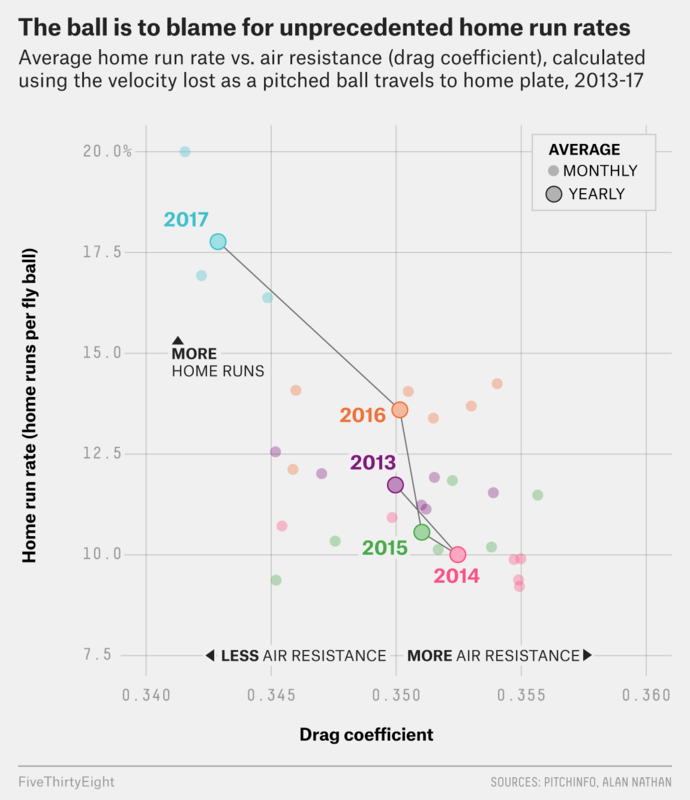 Ben Lindbergh and I documented the home run surge in detail last year, testing every hypothesis for its cause, including weather, performance-enhancing drugs, and the fly ball revolution. Each theory was rejected, leaving a solid trail of statistics that only a change in the ball would seem to explain. But identifying any alterations in the baseball becomes a problem of sample size. Without having a crate of game-used balls from each month of the season since July 2015, it’s difficult to find a concrete answer to baseball’s juiced-ball mystery. In a recent article for the Ringer, Lindbergh and Mitchel Lichtman made some headway despite these constraints. They experimented on three dozen game-used baseballs and found evidence that the ball became bouncier during the 2015 season, which explains about half of the home run surge. Lindbergh and Lichtman also found that, since 2016, the balls became smaller and their seams got lower — changes that ought to make the ball smoother and subject to less air resistance. When air resistance — also known as drag — decreases, a batted ball will go farther. High or low drag can mean the difference between a lazy warning-track fly out and a ball that lands a few rows into the seats. The findings in the data have anecdotally been supported by several players and coaches. New York Mets manager Terry Collins said in an interview with the Orange County Register, “The seams on the ball are definitely lower. … And there’s no question that the ball is harder.” Collins joined a chorus of established veterans who claim that the ball has changed this year, including Justin Verlander, Andrew McCutchen and Jake Arrieta. But a few irregular baseballs and a handful of grumpy veterans is not enough to prove that there has been a widespread change in the way balls are made. In a normal laboratory experiment, we’d need to spend tens of thousands of dollars to shoot countless balls out of an air cannon to establish beyond any doubt that the baseball’s air resistance had decreased. But it turns out there was an experiment in progress under our noses all along. Baseball’s camera- and radar-tracking technologies measure the speed of the ball shortly after the pitcher releases it and then again when it crosses the plate. By examining how much speed it loses between those two locations, we can calculate its air resistance (as measured by drag coefficient). For example, the average pitch loses about 7.4 mph on its way to the plate. The exact amount of velocity lost depends on the thickness of the air (which varies with temperature, weather and elevation), but a high-drag ball tends to lose about 8.7 mph on the way to the plate, while a slicker ball would lose only 6.5 mph. In total, the changes in ball drag explain about 25 percent of the variation in the ratio of home runs to fly balls over the last four years.2 Wind and weather can also influence drag, and although I controlled for those when I calculated the league-wide numbers, I also double-checked my analysis by looking only at Tampa Bay’s stadium, which is indoors and air conditioned. In the Rays’ home park, I found an even stronger correlation between home run rates and the ball’s drag coefficient.3 It doesn’t exactly come as a shock, but this is clear confirmation that air resistance influences home run rates. I also found a significant decrease in the drag on the ball in general over the past few seasons, with the MLB-wide average drag coefficient dropping by about 0.01 from 2015 to 2017.4 That might not sound like much, but Nathan’s calculations show that even a change that small can add up to 5 feet of distance on a well-hit fly ball,5 which in turn would be enough to make 10 to 15 percent more balls leave the yard in a given season. It’s highly unlikely that we’d see that kind of difference by chance without a real change to the ball: The monthly variation in estimated drag coefficients in the past five seasons varied from around 0.34 to 0.355, a far wider range than we’d expect from random variance alone.6 In total, the practical effect of shifting from a high-drag month to a low-drag month could be around a 30 percent difference in home run rates. From their low in 2014 to their high this year, home runs have jumped about 47 percent. About half of that increase occurred suddenly in the middle of the 2015 season, probably because the balls became bouncier, as Lindbergh and Lichtman found. The other half has been spread out over the 18 months since opening day of 2016. Some of the home run spike might be the result of players gearing their swings to hit more fly balls, but it’s clear that diminished air resistance also played a big role. About one-quarter of the home run spike could be attributable to decreased drag. So far, we’ve only focused on how changes in drag have affected batted balls. As for how the changes to the ball might affect pitches, we still don’t know. Hurlers generate movement on breaking pitches by orienting the seams to spin the ball. If those seams are lower, as Lindbergh and Lichtman found, pitchers could be less able to grip the way they’re used to. It’s difficult to see any effect on pitch spin in the data, however, and according to Nathan, for a given amount of spin, small changes in seam height aren’t likely to change the aerodynamic properties of breaking balls very much. Measurements of break have been much less consistent from month to month than those for drag, and MLB’s new pitch-tracking system, Statcast, has struggled to accurately gauge movement.7 So whatever effect the altered ball might have on pitches, we can’t reliably measure it yet. Like the proverbial butterfly flapping its wings and causing a hurricane, a handful of new hires at the Costa Rican factory where baseballs are made could have changed the history of America’s pastime. Those long-term fluctuations in air resistance mean that there’s probably nothing nefarious behind this home run spike. Tiny variations in manufacturing can send the ball’s drag up or down seemingly at random. But small changes can still make a real difference between a ball slugged into the stands and one dropped into an outfielder’s glove. And the last three years appear to have featured a series of variations in the ball’s bounciness and air resistance that ended up causing the largest, fastest home run increase in history. Like the proverbial butterfly flapping its wings and causing a hurricane, a handful of new hires at the Costa Rican factory where baseballs are made could have changed the history of America’s pastime. MLB declined to comment on the story, except to note that the league regularly tests the balls to make sure they fall within a defined range of standards. (Rawlings, the manufacturer of MLB’s baseballs, did not respond to a request for comment.) MLB’s statement might be true,9 but it is hollow: The range of acceptable measurements is so wide that, according to a 2000 report commissioned by MLB, two balls could both pass inspection even if they were constructed so differently that one would be hit 49 feet further than the other. My own research shows that drag alone could lead to a 30 foot difference in fly ball distance, which fits the results of controlled experiments on official baseballs. Nathan found that just a 7 foot difference in batted-ball distance is enough to raise home run rates by 25 percent, which means that MLB’s standards are so broad that they could permit a 100 percent change in home run rates without the commissioner ever finding a ball outside the acceptable range. To say that baseballs are still within the permitted specifications is like noting that a race car and a minivan are both automobiles: It’s not wrong, but if you pit them against each other in a drag race, a Ferrari would still beat a Dodge Caravan every time. Thanks to Alan Nathan, Ben Lindbergh, Mitchel Lichtman, Harry Pavlidis and the Baseball Prospectus Statistics Group for their help. I examined only four-seam fastballs to eliminate any potential influence of pitch type. The correlation was r=-0.52, p=.006. The correlation for just games played in Tampa was r=-0.70, p<9*10-6. Pitch-tracking changed over from PITCHf/x to Statcast in 2017, but the data I used corrects for the switchover by keeping the release point constant. We’re defining a “well-hit fly ball” as one with a 103 mph exit velocity that’s hit at 28 degree launch angle. To prove this, I built bootstrapped confidence intervals on the monthly average drag coefficients. The 99 percent confidence interval for each full month typically spanned only 0.001 in each direction, about one-fifteenth of the range of month-to-month variation. The technical issues that have plagued Statcast do not appear to extend to its velocity measurements, which means that my drag calculations ought to be comparable from season to season. To my knowledge, MLB has not defined an acceptable range for drag coefficient, but it has done so for characteristics like ball circumference that help to determine air resistance.